On January 12, 1966, the first episode of “Batman” debuted on ABC, and it became one of the most iconic TV shows ever made. With its Bat-Fight words and the Batusi, the show helped ignite interest in the comic book series. In 2014, the entire series was released on DVD and Blu-Ray for the first time ever. Stars Adam West, Burt Ward, and Julie Newmar still keep the “Batman” flame burning with their appearance in the 2016 animated film “Batman: Return of the Caped Crusaders.” We take a look at the cast of the show and dig up some trivia along the way. 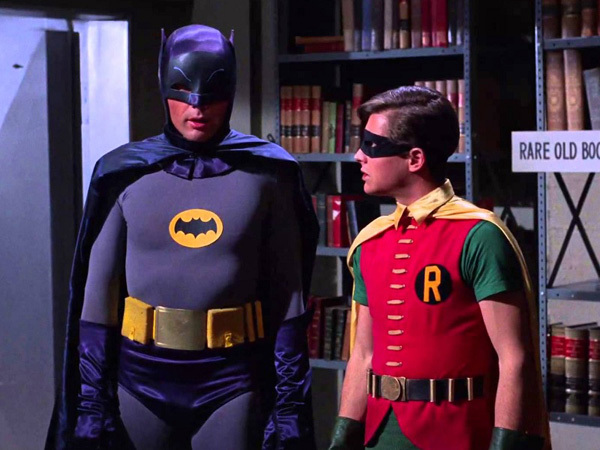 The ’60s were certainly more conservative times for America and because of this, there was some controversy surrounding Batman’s and Robin’s costumes below the belt. Producers had to implement different methods to cover both Adam West’s and Burt Ward’s crotch so viewers wouldn’t be so shocked or offended by any bulge that made itself visible on screen.